Calling all worthy sea dawgs! "Engaging and thorough . . . the best modern biography of the man. Why isn't there a great movie about Sir Walter Raleigh? His life had everything." Tall, dark, handsome, and damnably proud, Sir Walter Raleigh was one of history's most romantic characters. He founded the first American colony, gave the Irish the potato, even trifled with the Virgin Queen's affections. To his enemies, he was an arrogant liar, deserving of every one of his thirteen years in the Tower of London. Regardless of means, Raleigh's accomplishments are unquestionable: he was the epitome of the English Renaissance man. Raleigh Trevelyan has traveled to each of the principal places where Raleigh adventured-Ireland, the Azores, Roanoke, and the Orinoco-finding new insights into Raleigh's extraordinary life. His research gives a freshness and immediacy to this detailed, convincing portrait of one of the most compelling figures from the Elizabethan era. My colleague at the Lost Colony Center for Science and Research absolutely loved receiving this from me for his Christmas present. This book is emphatically NOT what one might generally suspect from someone claiming, as the author admits, "tenuous" claims to lineage with Sir Walter: a hagiography.Rather, it is an exceedingly well-researched, meticulously organised appraisal of the man and his times.Particularly impressive to the reader will be the author's footwork to visit and record his impressions of all the places around the globe to which Sir Walter himself actually voyaged in his long career.These excursions made by the author, the descriptions and photographs of these places as they exist in our age, serve to bring the vibrant Elizabethan age closer to our own.Also, Trevelyan is always ready to point out the gaps in our knowledge of what actually transpired; the biography is strewn with questions such as:What could this mean?Who was this person? What was in this particular letter? Etc.If anything, Trevelyan perhaps takes too many pains to show that he is not penning any sort of hagiography.To this reader, at least, it seemed that the he could cut loose a bit more, as his forbear does in his writings, and write a little more con brio. But this is a small complaint:In the end, we are left with an extremely well-rounded picture of the man, with his many faults, great daring, immense learning, who fought his way up from the lower ranks of society to be one of the men, at least in England and America, deemed one of history's true greats.It is hard to envision a better and more carefully written biography of Raleigh, barring the discovery of new documents, which may well happen.It's really quite amazing to learn how many documents, previously thought lost, have been discovered in the past 50 years, such as a will of Raleigh's discovered in a privy in the 1950s. I do have one major complaint: To any lover of literature, to which Trevelyan makes no claim, this book cannot but be a disappointment.Raleigh's poems are printed incomplete, with whole stanzas ripped out for no apparent reason.It's almost enough to make one weep to see how the soaring poem "The Lie" is butchered here. So, my advice is to have a copy of Raleigh's poems close at hand whilst reading the book.They are too much a part of the man to leave them in the state Trevelyan heedlessly does. Exhaustive biography of the name-sake of Raleigh, North Carolina (properly pronounced "Rawley", although Raleigh himself spelled it many different ways), a most interesting and modern man in a violent and backward time. This book has compelled me to write my first ever review.I've rarely read a more enjoyable biography.Although long and very dense, it is well cross-referenced, and well structured. The depth of research is astounding, and I was particularly impressed that the author had actually traveled to all the key locations, offering a level of colour and feel not otherwise possible. 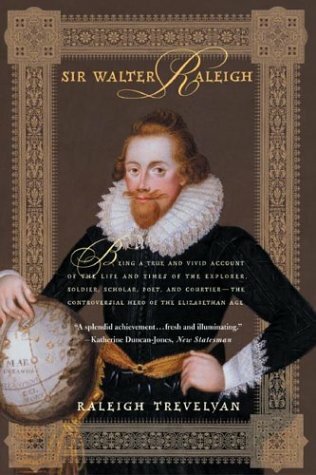 There is also a great detail of content outside of Sir Walter's own life that is immensely valuable for providing context (so important when reading about another time and place).For this amateur Elizabethan student, the opportunity to read about my favourite characters and the key events of the age from a different perspective was truly enjoyable. At times the book shows the author's bias, but he carefully lets us know when it's his opinion, and I for one welcomed it based on his depth of knowledge. Bravo to the author, and to those considering reading this book, a big word of encouragement.Enjoy! New insight - legend or fop?